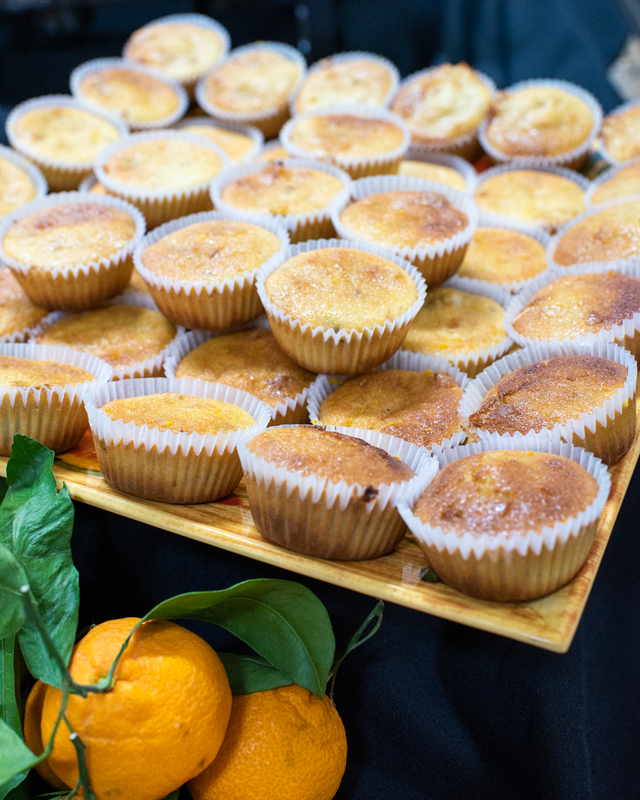 When you get an invitation from Melissa’s Produce to not only attend a presentation by Faye Levy, but also try her well-seasoned recipes, you just HAVE to say yes! Let me step back a minute and list the accolades, because they are IMPRESSIVE! Has taught at Montana Mercantile, Let’s Get Cookin’, and other cooking schools, and has demonstrated cooking on national and regional TV. Wrote for print magazines such as Bon Apétit and Gourmet. Has recently written articles for Los Angeles Times, the Jerusalem Post and the Orange County Register with her husband Yakir. Julia Child hailed Faye and Yakir as role models for cookbook authors in the book Foodwork: Jobs in the Food Industry and How to Get Them. I mean, this woman is the REAL DEAL whose passion for food is at the top of her list. 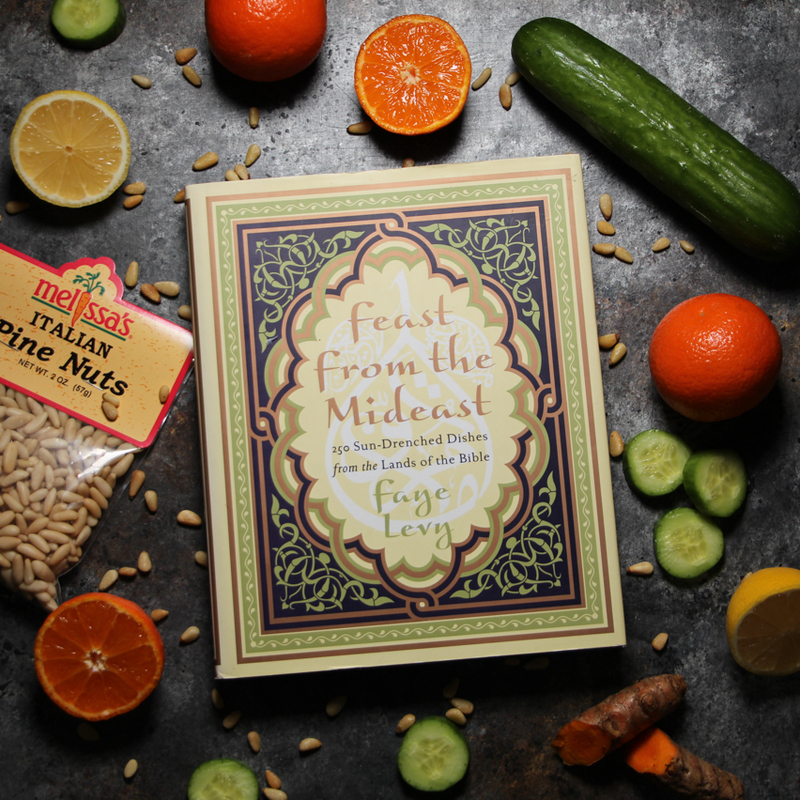 For this presentation, she highlighted her book Feast From The Mideast, but I ended up taking home Faye Levy’s International Vegetable Cookbook that contains vegetable dishes from cultures all over the world! What you see below are dishes from her Feast From The Mideast book, and are mostly all vegetable dips that are often enhanced in the Middle East with either tahini (toasted sesame paste), yogurt, or olive oil. 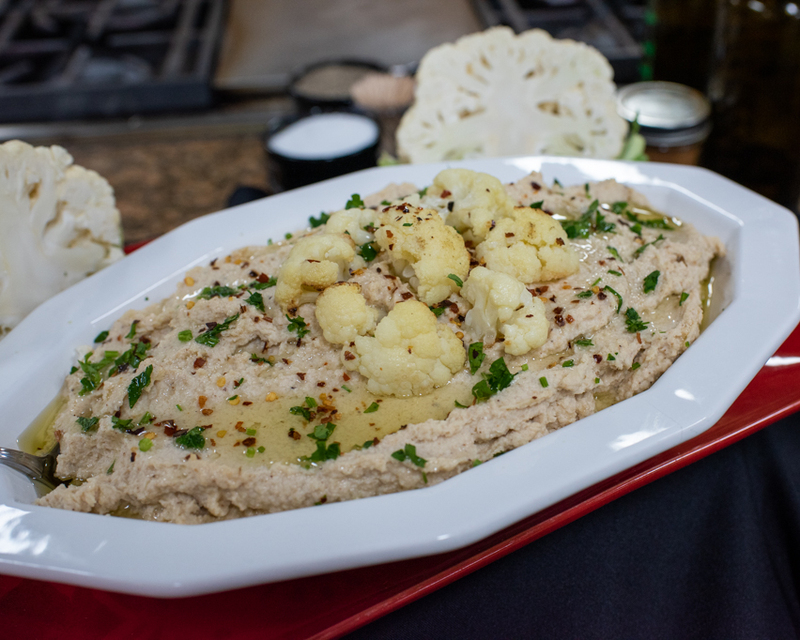 Serve with pita bread or other raw vegetables! I was fascinated by the story of Majadra (seen above) – which translates to a dish that has a combination of rice and lentils. It is such a staple of the Middle East that it’s well known throughout the area, but varies by region. This version uses cumin, garlic and chili flake as a seasoning, which is a staple of Israel. Exotic mushrooms were added on the top, and let me tell you – it was to die for! Persia has a version that is much sweeter, using dates and saffron as a seasoning. Move to Iraq, and in addition to cumin, they also use pepper, and tomato paste, making the dish a red hue. In Syria, instead of using rice, they use bulgur, which is a native crop to the region. Faye went on to demonstrate two recipes. One was Shakshuka, made with the Matbuha as the base to poach the eggs. The other was a sandwich called Sabich. Much like how chilaquiles was born in Mexico, Sabich was born out of leftovers from the night before. Fried eggplant is common appetizer for dinner in the Mideast, and so is stew. The leftovers from these two dishes comprise the bulk of Sabich. You make this sandwich starting with a thick pita or sturdy roll like Ciabatta, and start layering! Hummus goes in first to provide a sauce, then eggplant from leftover appetizer, boiled egg from the stew from the night before. Drizzle the fillings with tahini and a salty/sour pickled mango spread known as Amba. That stuff is amazing and delightfully curious if you’ve never had it before. 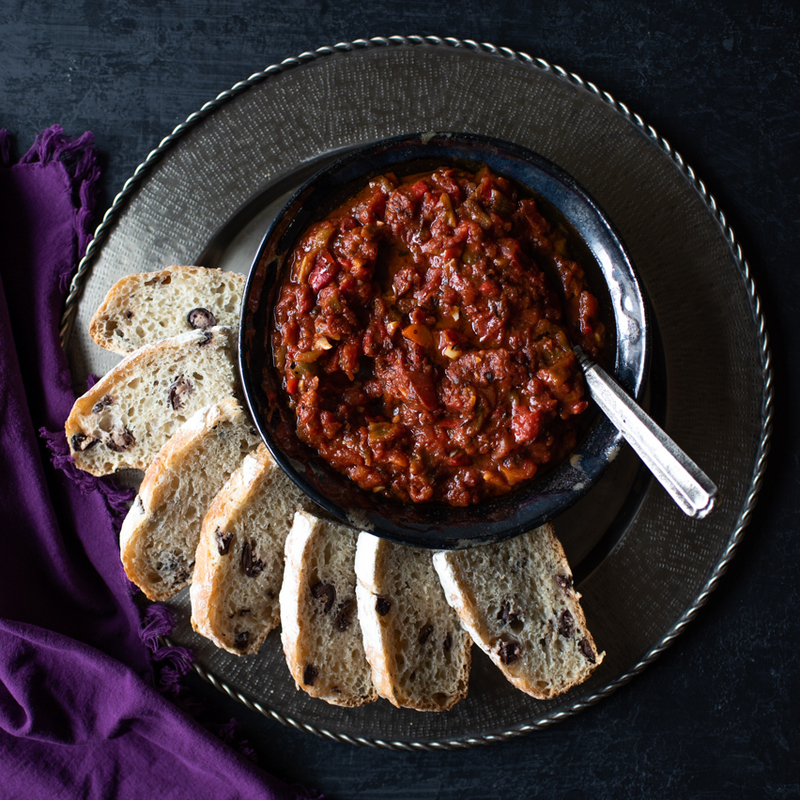 It’s not mango chutney – don’t make that mistake. It’s much more sour, and not sweet at all. Traditionally it’s served with a tomato/cucumber salad either inside the sandwich, or on the side. 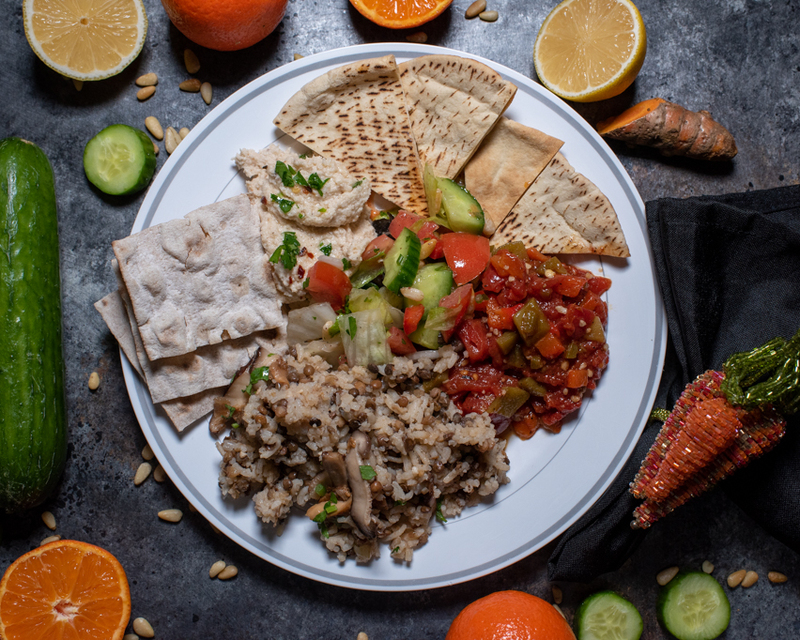 The star of the show during this presentation, however, was this dish – Matbuha, served with slightly crisped pita wedges and lavash. Oh My Heavens! It’s been a week, and I’m still swooning over this dish. The combination of canned tomato, garlic, roasted red and green peppers was seriously MINDBLOWING. No exaggeration. Sometimes the most simple things, if prepared properly, are the best things. I learn that lesson over and over in life, and I don’t mind it one bit! 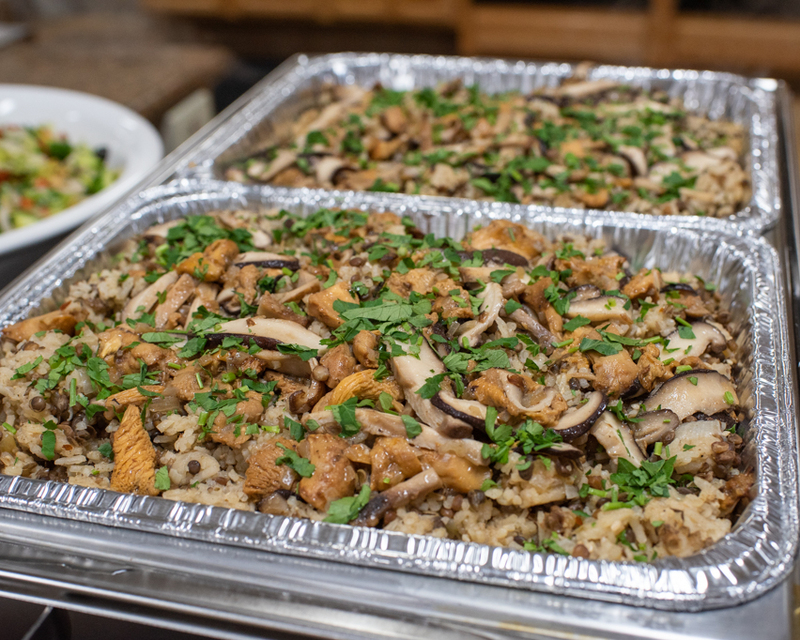 The completely plant-based spread from Faye’s presentation, including Cauliflower “Baba Ghanoush”, Mushroom Majadra, Matbuha, and Salad. 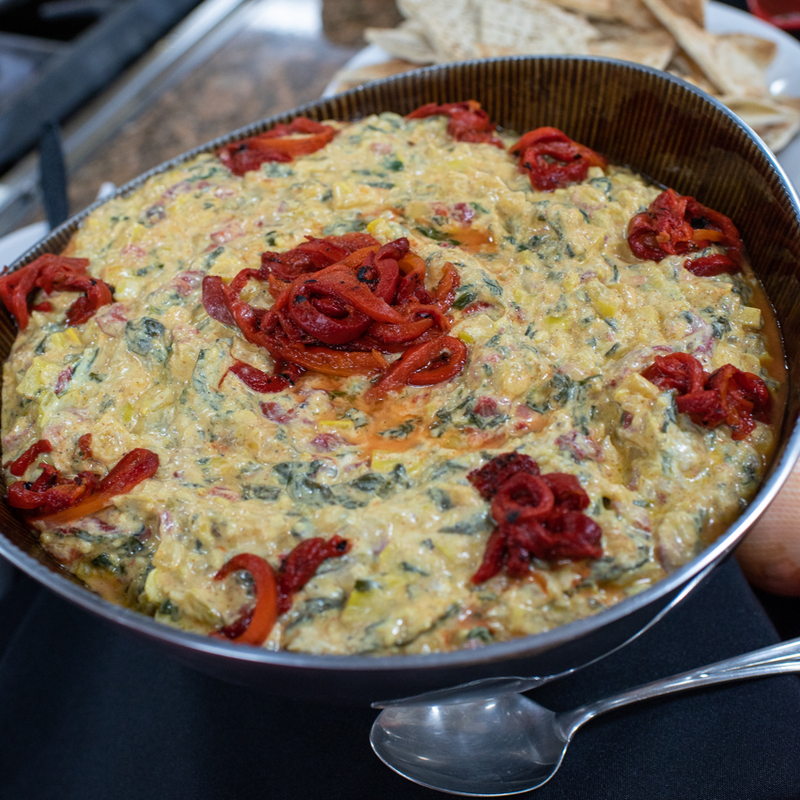 But today – TODAY, I’m going to give you the recipe to my favorite dish during this presentation – the Matbuha. I can’t say enough good things about this dish, but JUST TRUST ME. You will eat this with pita, you will eat this with cucumber rounds, in my case today, it’s home-made olive bread. You could fry up planks of tofu or eggplant, and drench this on top. I bet it would go great with those plant-based hot Italian sausage links. Any vehicle you can find will work, just get this in your mouth. I do hope you enjoy this “salad” immensely, as I do. My version came out equally as good as the one I had at Melissa’s Produce, so I know you can do it too. It really is easy, and actually, would be PERFECT for a Super Bowl appie… Just sayin’!!!! If you’d like to follow Faye Levy on social media, check out her Facebook Page, Instagram, and Twitter. 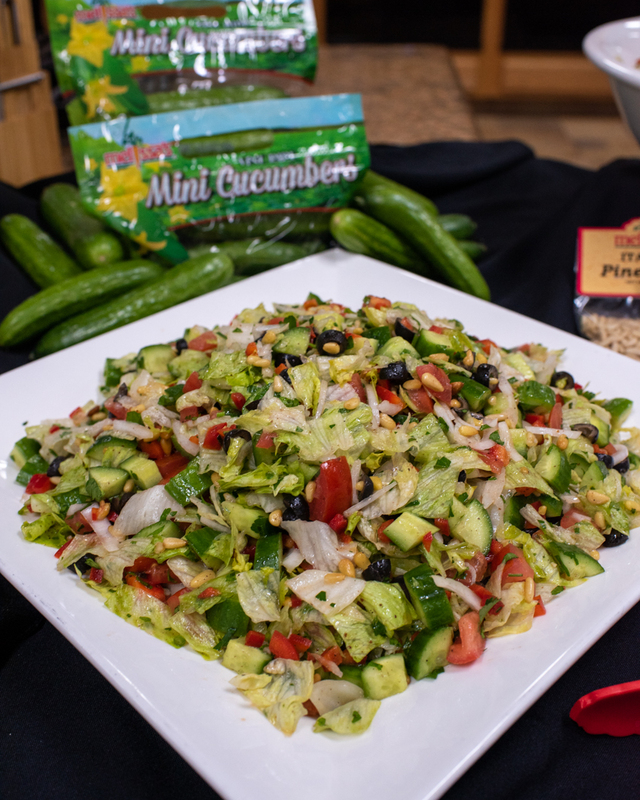 This is known as a “cooked salad.” Serve it on its own to begin a meal, as a dip with fresh pita bread or as an accompaniment for grilled eggplant or tofu. Dice peppers. Heat 2 or 3 tablespoons oil in a large skillet. Add garlic and chiles and sauté over medium-low heat for 30 seconds. Add peppers and stir briefly over heat. Add tomatoes, paprika, salt and pepper. Cook uncovered, stirring often, until mixture is thick, about 15 to 20 minutes if using fresh tomatoes or about 10 minutes if using canned ones. Stir in remaining olive oil, if desired. Taste and adjust seasoning. Serve in a shallow bowl at room temperature. 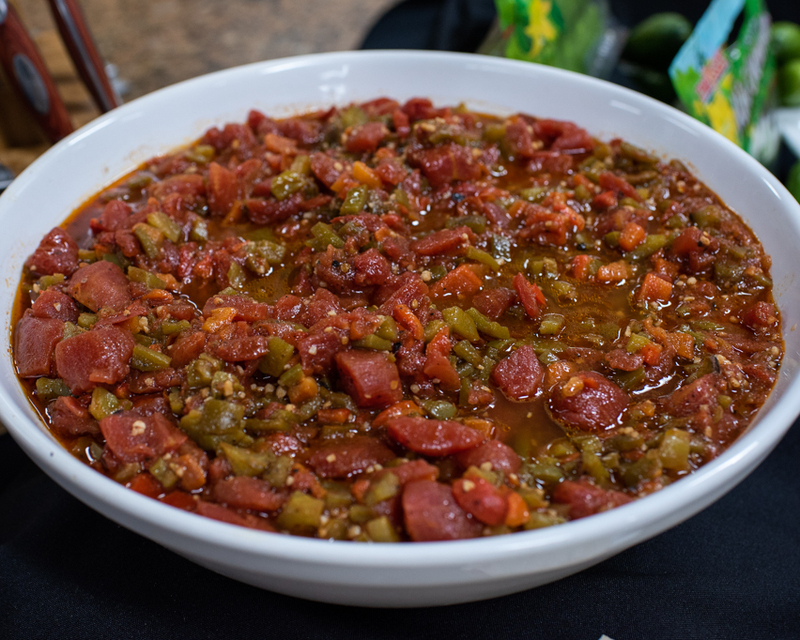 * Instead of fresh peppers, you can use roasted jarred peppers. 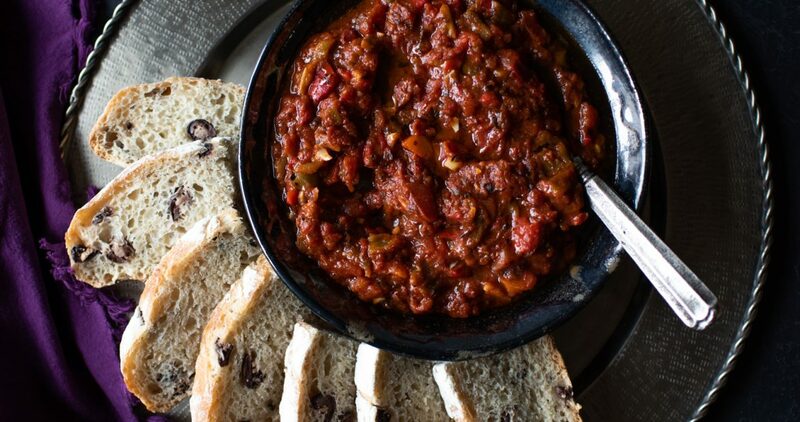 * Instead of fresh tomatoes, you can substitute a 28-ounce can diced tomatoes, drained. 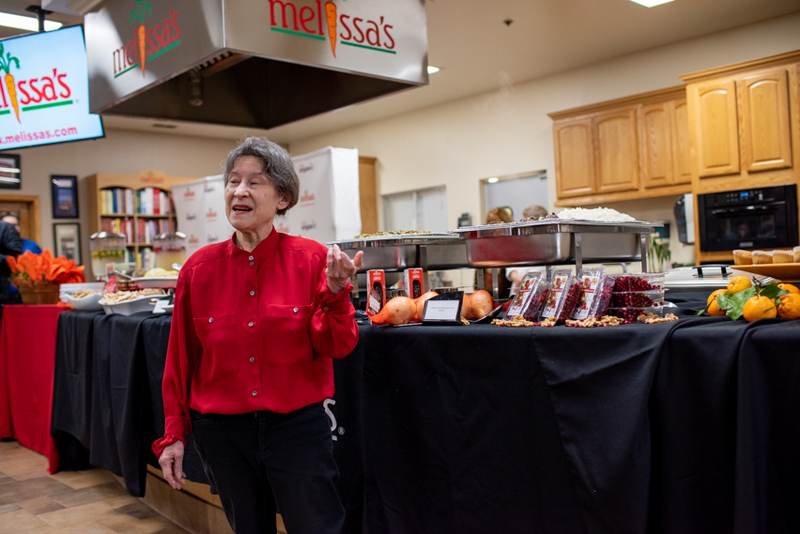 *Disclaimer: Melissa’s Produce provided us with a copy of one of Faye Levy’s cookbooks, and produce, including jarred roasted peppers, garlic, and Hot Hatch Chile Powder. I was not compensated in any other way, and all opinions are completely my own. Gorgeously done as always Natalie! Faye is a culinary powerhouse and her recipes are spot on. Thank you kindly, Cathy! I am in complete awe of Faye. Thank you, Cathy, and thank you, Natalie, for your kind words! Thank you, Natalie, for your beautiful rendition of my recipe for matbuha. 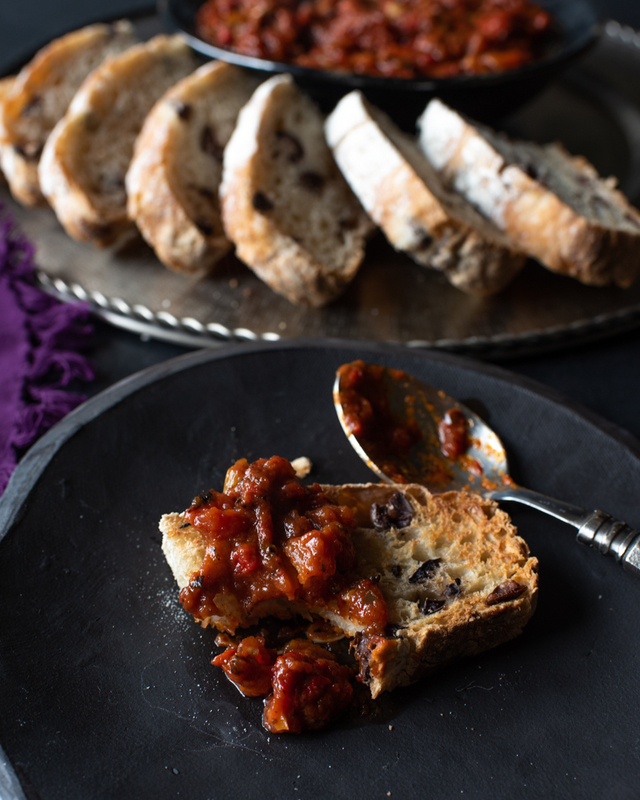 That’s wonderful that you ate it with your homemade olive bread–the perfect accompaniment! 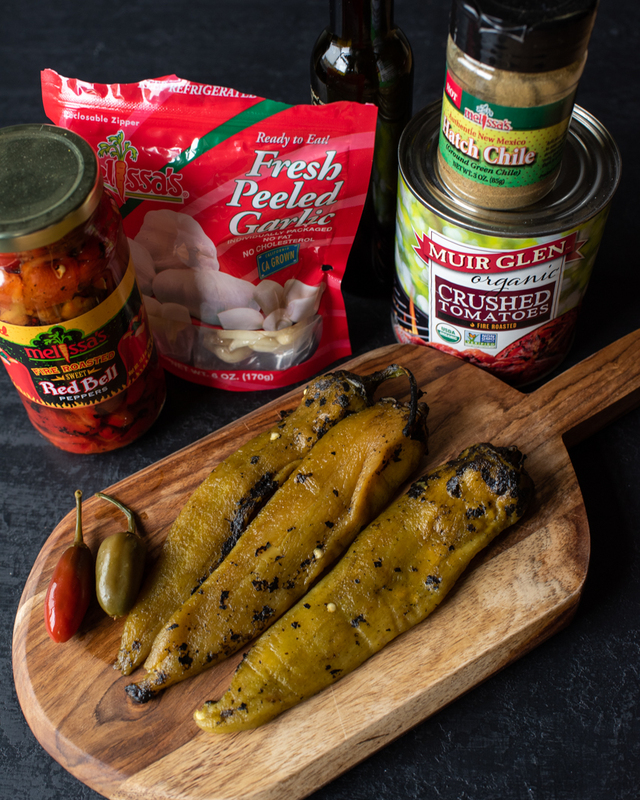 What kind of chiles did you roast and peel? Also, thank you for your kind words about my work. I loved your photo of the vegan plate you put together from my menu! Yes, absolutely, Faye! Indeed the olive bread was divine with this! 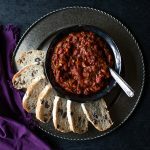 I had some roasted Hatch chiles from this past season in the refrigerator, so I used those along with the Melissa’s Red Roasted Peppers. Instead of the paprika, I used Melissa’s Hot Green Hatch chile powder. This rendition has a slight kick! Pete, it’s so easy and so GOOD! Great with pita chips too.